"Hi, Can anyone help? My WhatsApp is crashing since iOS 11 update. I updated yesterday and getting the problem. Any advice! Thank you!" Welcome! Many users have reached us and complained about this particular problem. iOS 11, similar to other iOS updates has given many issues while installing or after installation. We have helped in every possible way and we are here again. So, if your WhatsApp crashes in iOS 11, here are some solutions to try. Space can be a big issue when WhatsApp crashes in iOS 11. The primary thing you should do when you get this problem is to check the space availability in your device. 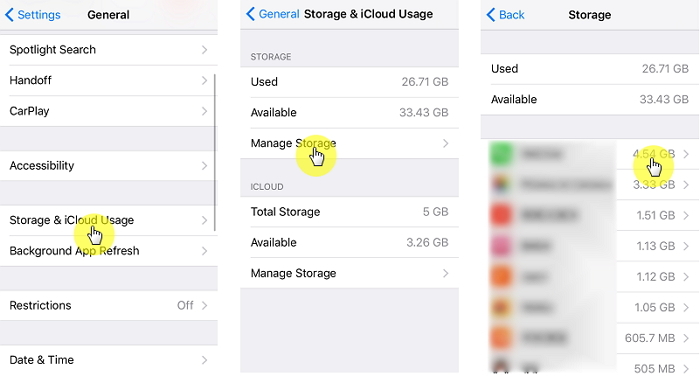 Open "Settings" > "General" > "iPhone Storage". A list of apps will appear with the amount of space each one is using. Check the apps you don’t need and delete accordingly. Do this and see if this advice is useful. If not, you can try other fix to get the problem solved. After making backup, just hold the WhatsApp icon on the Home screen. Tap on the "x" icon when the apps jiggle and tap "Delete" to confirm. Now reinstall it and restore WhatsApp data from a suitable backup. 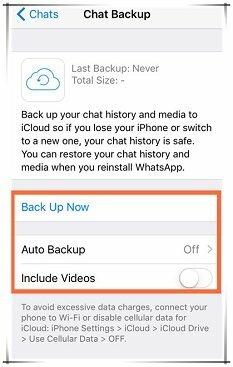 The Auto Backup can be a trouble if your WhatsApp is crashing since iOS 11 update. So, the solution is to disable it. For this, head to the "WhatsApp" app and open it. Tap "Settings" > "Chats" > "Chat Backup" > "Auto Backup" and disable it. The problem can also occur if you have recently got the latest Facebook version and turned on contacts sync option. Yes, one of the reasons when WhatsApp keeps crashing after updating to iOS 11 might be contact sync between Facebook and iPhone. WhatsApp is responsible for resizing the images that are in Contacts app. And since contacts are synced with Facebook, try disabling the sync between them. 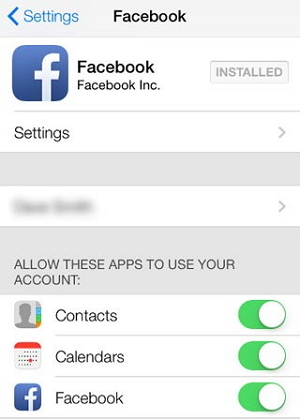 Take your iPhone and move to "Settings" > "Facebook"> "Contacts" and tap on it to disable. This has worked many times. Resetting all your settings means your device will reach the stage of default settings similar to when it was bought. Since this method has worked for many cases, try this when WhatsApp crashes in iOS 11 also. Just go to "Settings" > "General" > "Reset" > "Reset All Settings". After this, type in your passcode and tap "Reset All Settings" to confirm the process. If still your WhatsApp crashes in iOS 11, we doubt it is a software issue. 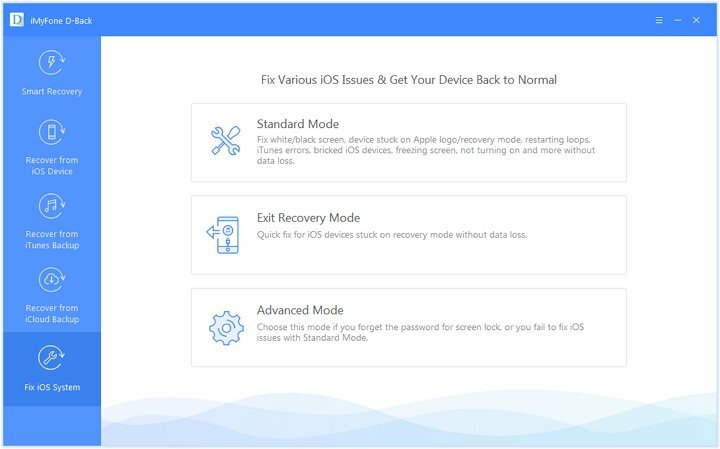 You can recover any iOS issue with the help of iMyFone D-Back which is a powerful tool for fixing various software glitches. Its "Fix iOS System" feature helps in repairing iOS issue without altering any data in the device. 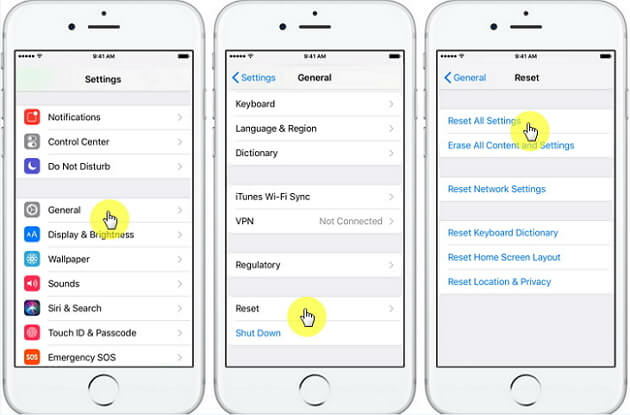 There are three different modes that are associated with "Fix iOS System". The modes are "Standard Mode" which will not cause any data loss, "Exit Recovery Mode" and "Advanced Mode". This tool is amazing and provides good results. You can also use it when you meet an iTunes error 4013, iTunes error 9, or your iPhone gets a problem like restarting randomly, stuck on recovery mode, freezing on Apple logo and more. 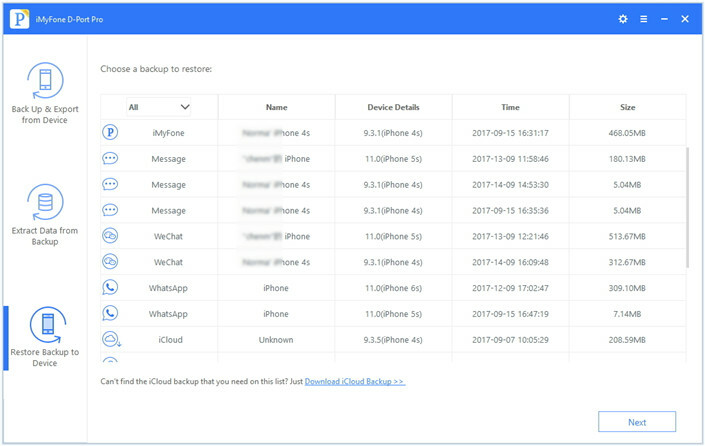 iMyFone D-Back is also a data recovery tool which supports to recovery 20+ types of data like WhatsApp, messages, contacts, notes, WeChat, etc from iOS devices or iTunes/iCloud backup. iMyFone D-Back is extremely simple and safe to use and it was recommended by the famous media sites like Macworld and Makeuseof. It is also completely compatible with iOS 11 and other iOS versions. We are going to tell you how to use the program to fix WhatsApp crashing problem.First of all please download the software on your computer. Step 1 – Launch iMyFone D-Back and select "Fix iOS System". Using a USB cable, connect iPhone to the PC and choose "Standard Mode" from the given modes on the screen. 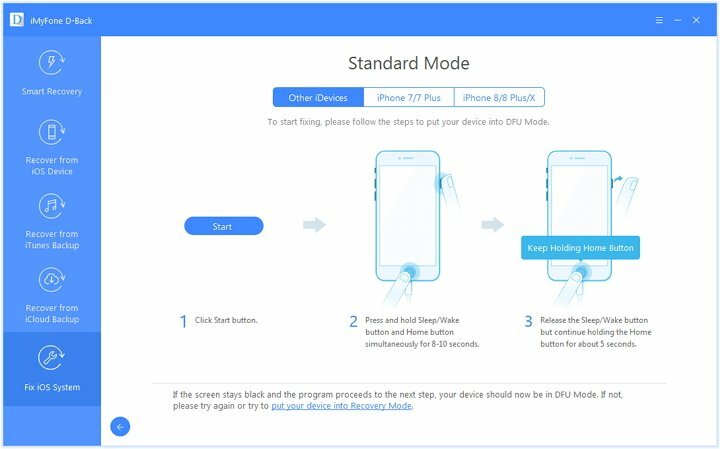 Step 2 – Press "Start" button and follow the instructions to put the device in DFU mode, or switch the instruction and set your device into Recovery mode. This will help the program in detecting your iPhone. 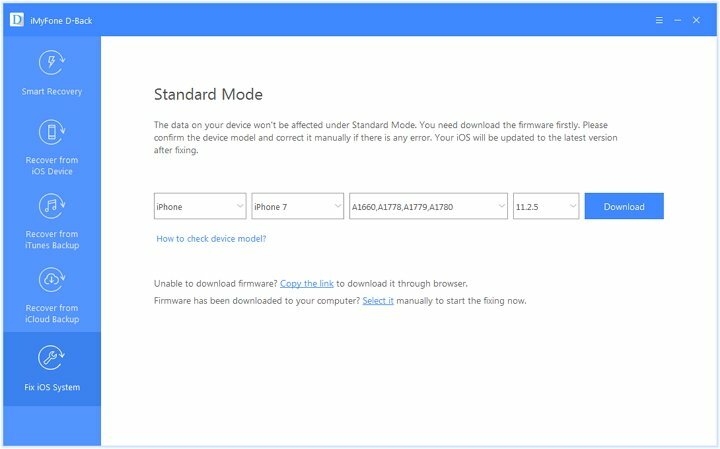 Step 3 – Now, since the device is detected, you will easily get the latest suitable firmware for your iPhone by the program. Just click on "Download" and leave the rest on iMyFone D-Back. Step 4 – Lastly, click on "Start to Fix" button and let the program fix the problem. It is the time to conclude the discussion. We introduced some of the solutions which can be helpful if WhatsApp crashes in iOS 11. You can also try the above tips if you are not running iOS 11. All in all, we expect that we could assist you in your trouble. Let us know which was useful to you or you have any suggestions.